Welcome to the world of stars! 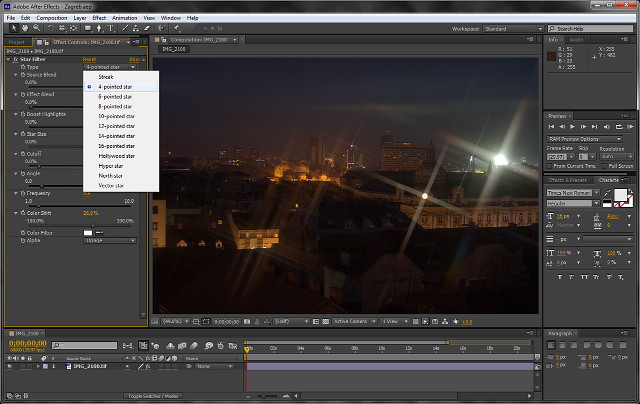 This plug-in for Adobe After Effects simulates star lens filters (also known as cross screen filters) - it adds star streaks to lights and highlights. It can create a star filter effect with 4 to 16 pointed stars. You can adjust parameters such as angle and size, while seeing the results updated in real time. Optical realism was a primary concern and is achieved with advanced image processing algorithms. You can also observe the rainbow patterns, which are typically visible when using such lens filters, and you can change its parameters for artistic purposes. Because highlights in videos are often clamped, we added a highlight boost feature to extend the dynamic range of such footage. The plug-in also features non-regular star shapes, supports for 16 and 32 bits per channel (float) precision. Now compatible with El Capitan and CC 2015. You can download the demo version for Windows here and for Mac here. The demo version will watermark the image. - Added the ability to change the color of the star streaks using a color picker. - Effect can now be applied to text layers. - Added the ability to set the alpha channel to opaque in order to work correctly with several blending modes. - The star streaks will now expand beyond the extents of a layer. - Star size is now proportional to the width of the video. - Changed the maximum effect blend factor to 500%. This makes sense when using the cutoff feature, which has the side effect of dimming down the star streaks. - Potentially improved performance on multi-core CPU-s.
- Fixed a problem with the blending formula in 16 bit mode.